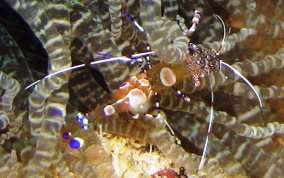 Spotted Cleaner shrimp are known to associated with various species of sea anemone. They groom the sea anemone, removing dead tissue and parasites. 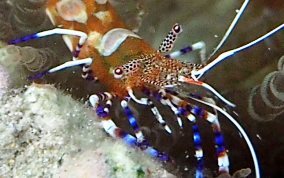 The also will wave their antennae to attract any fish that may need their mouths or gills cleaned of parasites. 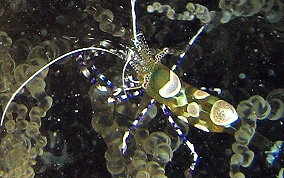 The shrimp bodies are transparent, but with large, colorful spots. They are only about an inch long and can be found in water 3 feet and deeper.